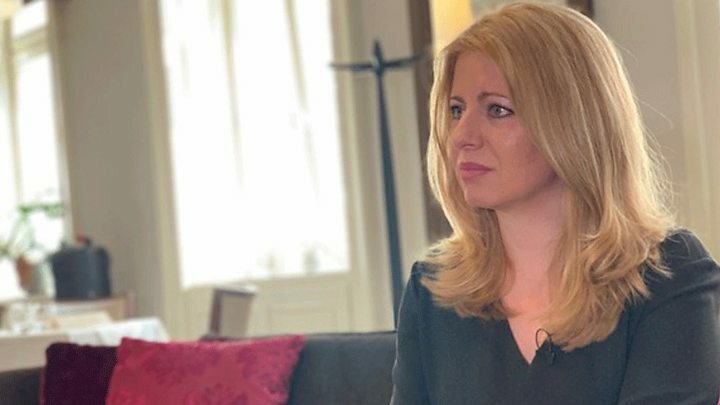 "Populism is not the only way to resolve frustrations, or crises or a loss of trust in politicians," says Zuzana Caputova.Rays of spring sunshine poured through the plate glass windows of a Bratislava cafe for her first TV interview with the international media since she was elected president of Slovakia on 30 March. "A constructive tone and more positive emotions - and not working with fear or threats; these are far more effective, and hold out much more hope," she says.Western media have already been accused of giving too favourable coverage to an openly liberal, pro-EU political newcomer who defends traditional media, decries fake news and whose public pronouncements are peppered with words like "truth", "tolerance" and "compassion".But Ms Caputova's progressive message was both unusual and controversial in a conservative, largely Catholic nation such as Slovakia. "I think the main theme of this election was justice, fairness, equality. If I feel that a particular minority is the victim of hate, then my obligation is to speak out about it and defend them," she says. "But when it comes to sensitive cultural and ethical questions such as the rights of people of homosexual orientation, the way I see it is that any change must come about as the result of social consensus," adds the divorced mother-of-two, who supports the rights of gay couples to adopt children if the alternative is those children languishing in orphanages. Certainly her words strike a sharp contrast to the aggressive, nativist language of political leaders elsewhere in Central Europe. She is diplomatic when asked if at least some of her victory speech was directed at people like Hungary's PM Viktor Orban or her Czech counterpart Milos Zeman, who says Islam is the enemy of Western civilisation and has joked with Russia's Vladimir Putin about liquidating journalists. "Well, it was primarily a message to people and voters inside my own country," she says. "But of course my election could also serve as an inspirational experience for people in other countries." Next week, the president-elect will move from her rather dingy offices near the River Danube to provisional quarters by the presidential palace, to work on her transition ahead of her inauguration on 15 June.And while her 58% showing was a stunning political success for a novice, she is not universally adored. "Her election slogan was 'Let's Stand Up To Evil'," says Juraj Marusiak, a political scientist with the Slovak Academy of Sciences. Ms Caputova's campaign posters read: "Stand up against evil, together we can do it"
"In doing that she reduced her political message to the binary opposition between 'good' and 'evil' and as such she was copying exactly the kind of political mobilisation used by populist politicians. "Others point out the limitations of her largely, but not entirely, ceremonial role. "There's a 25-year tradition ever since Slovakia became independent that the president is essentially a weak politician, a second-rate sort of political personality," says Jaroslav Daniska, a commentator for the conservative online daily Postoj. "If Ms Caputova toes this line and doesn't try to be too politically active, she'll be popular," he says. "If she tries to press her party's agenda, she will risk being politically marginalised. "Within hours of her victory there were signs that Zuzana Caputova was already becoming a consummate politician.Her first act as president-elect was to cross the road from her election party to light a candle at the memorial to Jan Kuciak, the journalist whose murder set off a seismic chain of events that has led her to the presidential palace. "I worked with Jan on several cases. I could see that he was an honest and good journalist," she told me. "To this day his tragic death and the death of his fiancee is uncovering more and more facts about the weak spots in our judicial system. "I don't doubt for a second that her tribute was a sincere one; Zuzana Caputova, like many Slovaks, still seems deeply pained by the senseless deaths of two young people.But conveniently there was also a journalist there to film it. And within seconds it was being streamed as a Facebook Live. » Elections in Slovakia: What Zuzana Caputova's victory means for Ukraine?